I can’t believe another month has gone by… Lion has become … like a family member. He’s completely at home now and the cats tolerate him very well. He tolerates the cats well too. He never tries to invade their territory. He knows that the room with their food and litter is off limits and he doesn’t try to get in there. Occasionally the cats and Lion will touch each other’s noses. … Scott has spent most of the month sick with bronchitis… Lion is extremely loyal to Scott. He stayed with Scott while he was resting. It was hard to get Lion to leave for his walks. Once I got him out he walked very swiftly to get back to Scott Lion is completely dedicated to Scott. Scott is dedicated to Lion. 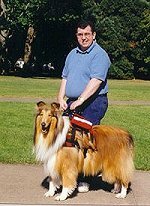 Lion takes his duties very seriously and he constantly watches over [Scott] whether he is in harness or not. Lion rests when Scott rests but he remains close by Scott. Lion still likes to look out the car window… He is …interested in everything going by him. To make sure that he doesn’t get hurt if we have to stop suddenly, we devised a system to strap him in with his harness on…. Lion can look out the window and when we stop suddenly he doesn’t fall. If he wants to lie down, he can do that too. We have taken Lion out to dinner quite a few times. We went to the Red Lobster … and ran into someone who had a friend with a service collie named Blessing. She was bragging about how wonderful the dog was. (is this the same Blessing you mention?) … All but one restaurant has been very receptive to [Lion]. The one exception was a small Japanese restaurant whose owner spoke very little English. 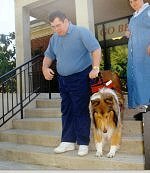 He could not understand that Lion was a service dog. He kept saying “no dog Health Department says no!” So we just left and crossed the restaurant off our list. We decided not to pursue a penalty since it was a communication problem. Lion went to an Employee Appreciation Dinner last week he made quite an impression on my fellow employees. A lot of people stopped to pet him and he just loved it. Lion does very well in stores. He enjoys attention from people.. He understands the phrase “what a beautiful dog.” He stands up much taller and wags his tail…. Scott still gets his words mixed up when giving Lion his commands. Lion quickly assesses the situation and figures out what Scott wants. It is really neat to watch the interaction between them. [Lion] also collects toys. He has in his possession all of the cat’s mice and feather toys. He doesn’t play with them but he won’t give them back to the cats. If I put them back where the cats can play with them, Lion goes and gathers them up again and puts them in his space (he has claimed Scott’s office). Occasionally my stuffed animals will end up in his pile and I get away with taking them back. He alwavs finds another one to grab so the game goes on. More to come next month. Lion will be going away with us for a weekend and staying in a resort. I thought that you would like to know how Lion weathered the trip to [the funeral in] Philadelphia. He was described as the perfect dog by Scott’s sister-in-law. That described how he behaved. Lion settled down on the plane after the first takeoff. He learned that he needed to lie down and sleep while the plane was in the air. The flight attendants loved him and the fellow passengers remarked that he was much better behaved than most children…. Lion was curious … he looked out the window once and decided that he really didn’t want to see what was going on (he didn’t like seeing the clouds). The only problem we had throughout the whole trip was in the Philadelphia airport, A woman at the security check point would not let us through because we didn’t have a paper from the airlines. I guess that she got in trouble from both the airline and her boss because she wouldn’t listen to us that he was a service dog and didn’t need any extra papers. She was very apologetic to us as we went down to the gate. Things are getting back to normal… Scott and I are adjusting to Judy’s death and Lion is there constantly comforting Scott. 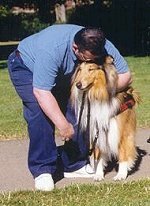 He is such a blessing to Scott – he meets his physical need as well as providing much needed companionship while I’m at work. Lion also eases my burden. I no longer have to worry about Scott being alone.